30 Rock has come a long way from being the “Untitled Tina Fey Project”. While it hasn’t been a ratings blockbuster, it’s crawled its way inside pop culture in a way other shows would kill for. It’s also launched (and relaunched) the careers of its leads, Tina Fey and Alec Baldwin. The fifth season of a show is a milestone of its success, since it now has enough episodes to sell to syndicators. Being able to sell the same work multiple times is always a good feeling. Does the show still have what it takes? Hit the jump to take a look at how season five pans out. 30 Rock centers around Liz Lemon (Tina Fey), the showrunner for a Friday night sketch comedy show. The principles include her temperamental star/BFF Jenna (Jane Krakowski), her other temperamental star/Hollywood weirdo Tracy (Tracy Morgan), the creepy/naive page Kenneth (Jack McBrayer) and her boss, corporate shark Jack (Alec Baldwin). By the fifth season, a lot more characters have an impact on the characters and their storylines. 30 Rock’s core ensemble is already stellar but when you add in characters like Jenna’s drag queen/Jenna impersonator boyfriend and Jack’s hot conservative wife, you get dozens of characters that stack the deck for laughs. The show always had a semi-autobiographical bent to it thanks to Fey’s long time position as Saturday Night Live’s head writer. This year is no different, featuring NBC’s merger with Kabletown, a thinly veiled stand-in for Comcast. The show also has to deal with budget cuts, Tracy wrestling with legitimacy, Jack becoming a father and the destruction of Liz’s best relationship by her own hand. It sounds very soapy, but 30 Rock has managed to mostly avoid the sentimentality that plagues sitcoms as they get older (we’re looking at you, The Office). Fey and her writers aren’t afraid to make their characters look silly, her own included. The strongest episodes of the season include a live episode and an off-format swipe at reality shows. The live episode harkens back to Fey’s days on SNL, but it seemed like a no-brainer considering the cast is packed with old cast mates and Baldwin, one of the greatest hosts of all time. The method they use to maintain the show’s cutaway/flashback signature gag is very clever. The episode “Queen of Jordan” follows Tracy’s wife Angie (Sherri Sheppard) as her reality show comes to the show’s studio. It’s a pitch perfect parody of those obnoxious semi-celebrity shows that fill up Bravo and VH-1’s schedule these days and it’s also a fun way to see familiar faces in a new way. The season on the whole is strong but the final two episodes don’t quite come together. “Everything Sunny All The Time Always” injects a little political parody into the mix when Avery is held hostage in North Korea. It seems like a convoluted way to write Elizabeth Banks out of the show. Despite a looney performance by Margaret Cho as Kim Jong Il, it sets up a cliffhanger for the next season that never seems very compelling. “Respawn”, the episode that airs after, doesn’t help matters either. 30 Rock works best when it takes sitcom cliches and tweaks them just enough to feel fresh. This episode loads up with cliches but never gets around to freshening them up. The set includes the west coast version of the live show. Watching for the difference between the two is like a It also includes the Executive Superhero animated webshorts. These are good for a chuckle or two but they never quite get off the ground. Deleted scenes, audio commentary and a behind-the-scenes look at the live show round out the extra features. 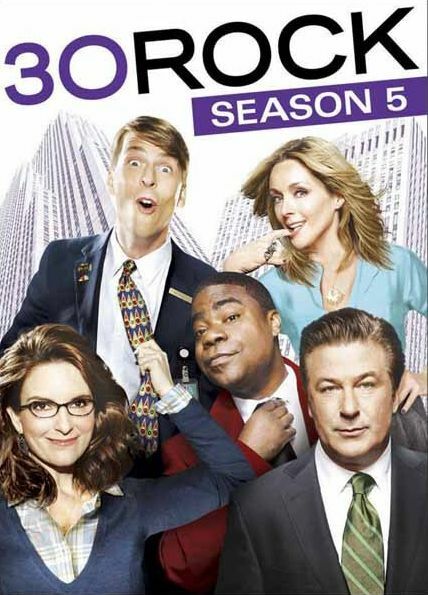 30 Rock returns to form in season five and fans of the show should not let this one slip through their fingers.